Pre-heat the economy to unsustainable levels of indebtedness. Continuously mix benchmarking agreements with Social Partnership appeasement, all the time adding in rising tax revenues from vat, capital gains tax, excises and stamp duty. Introduce the decentralisation plan and immediately add the remaining benchmarking agreements to ensure the decentralisation plan blends in smoothly. Baste the mixture in labour shortages, immigration and rising private sector wages propped up by a high minimum wage floor, then sit back and watch it expand. 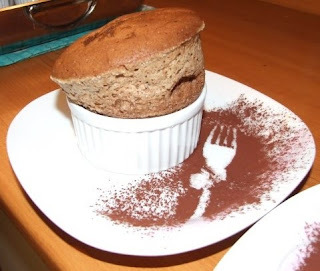 But soufflés are tricky things as everyone knows. Especially a Public Sector Soufflé. If you open the 'oven door' at the wrong time - say, by letting in the cold winds of economic recession - then the whole thing collapses. Which is what we are experiencing right now. The private sector has no choice but to deal with the realities on the ground. And that means for most businesses serving the Irish market that the overall level of demand in 2010 will be on par with what it was in 2001 - give or take a year. 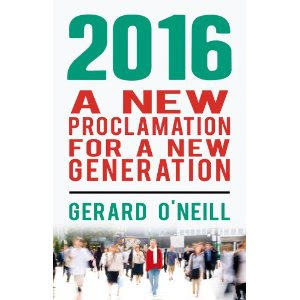 We now look set to end the decade with a standard of living not much higher than when we started it. But there's one big difference - our 2001-sized private sector will be supporting something like a 2007-sized public sector (allowing for modest reductions in public sector spending last year and this year). And that's assuming the Government doesn't concede any more reality-denying pay claims from public sector unions. Recessions are typically characterized by inventory cycles – 80% of the decline in GDP is typically due to the de-stocking in the manufacturing sector. Traditional policy stimulus almost always works to absorb the excess by stimulating domestic demand. Depressions often are marked by balance sheet compression and deleveraging: debt elimination, asset liquidation and rising savings rates. When the credit expansion reaches bubble proportions, the distance to the mean is longer and deeper. But there's one other special ingredient that we have to add to the Public Sector Soufflé here in Ireland. And that of course is NAMA. NAMA just might serve the purpose of - ultimately - increasing asset prices (which Harrison points out is the only tool available to governments to prevent further balance sheet destruction due to further, massive writedowns by banks). But the problem with NAMA is that it will add massively to our national debt which will rise from 25% of GNP two years ago to 140% of GNP over the next four years according to Constantin Gurdgiev. 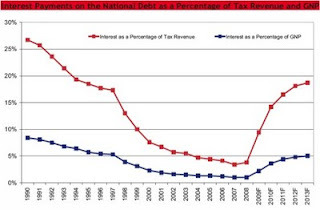 In that scenario 33% of tax revenues will go to simply servicing the national debt. The chart does not factor in the costs of NAMA as the details weren't available at the time the report was published.